As I walked through the doors of the Palmer Center to see the 2019 Winter Photography Exhibition, I was invested in the enthusiastic feeling of seeing the artistry of my fellow students. It is a form of revelation— showing and publicizing a part of oneself through art. 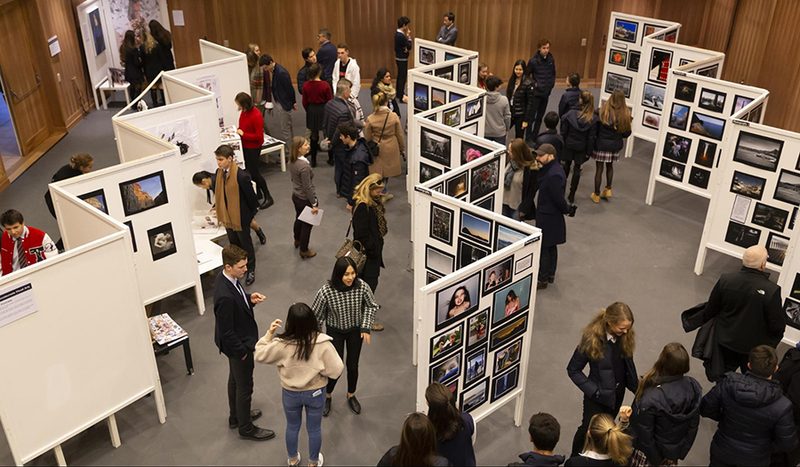 This annual exhibition—held on January 25–27 this year—presents the work of TASIS student photographers, including works in progress by AP, IB, and other advanced students. Images from more than 70 students were exposed on white backgrounds that brought the attention directly to the main subject, almost making its surroundings go on mute and fade away. Students from different grades and with a wide range of skill levels and interests got the opportunity to bring light to their creations, giving them an identity that others could recognize as time went by. This recognition is the essence of what photography itself does. Read about how TASIS visual artists (and other students) have excelled on both AP and IB exams in recent years, including exceptional class averages of 4.82, 4.57, and 4.67 (out of 5) on the last three AP Photography exams. "Think of photography as a comma in your day, as a way to unwind from other classes while still being engaged with the academic side of it." This is how Ms. Kim Nelson, veteran School Photographer and AP Photography teacher at TASIS, described photography class to me. It is a simple way to relax while still being productive. What I learned in the two weeks of research I did for this article is that photography is not just a subject or something you do without thinking. It’s a mixture of appreciation and admiration that uplifts your spirit whenever the light is perfect, the angles are symmetrical, the composition is pleasing, and the right amount of shading exists. It’s a bouquet of precision and passion tied with a red string of observance. And once you start photographing, you swim through waves and waves of new subjects and creations that you have never even visualized before. And that is when you feel the change. Something in your perspective varies positively. Your worldview has expanded, and you cannot unsee the perfect representations of subjects that our Earth gives to us almost jealously—because we get to capture it and meanwhile she can only watch it until it’s gone. During my journey toward understanding the strength one exhibition can have, I met with IB Photography student Filippo Antonello ’20, who said, "A picture has the freedom of interpretation...most of the time you cannot control it; for example, in street photography it’s just people being people, living life day by day." This particular sentence shifted the meaning that I had previously absorbed. Photography can be so many things—it’s almost like the prettiest person in the room who denies anyone who offers her a dance. I learned that photography can be all you want it to be. Megan Chen ’20, an AP student, told me that she wants her photographs to tell stories since behind every photo there is a memory. I began to understand that the meaning for photography is undefined since everyone can truly develop and grow with their own way of photographic expression. There are no barriers—it can stretch itself to anyone's mercy. I ultimately came to the realization that this exhibition is a way to expose how everyone sees and interprets photography. I naively tried to define it at first, but many do not need to because there are plenty of descriptions and personal opinions that describe photography as unique in countless ways. I believe students all over campus have a reason why they take a particular photograph—whether it’s an Instagram photo or a landscape picture or a portrait of a classmate. Whatever the reason is that brought them to take that shot at that precise moment is what connects all the definitions together: the urge, the innate will, and the hunger to capture that moment and make it yours. Carpe Diem. This course introduces students to the basics of digital photography, covering the entire process from capturing images to output for print and web. As students begin to understand the digital workflow, they are expected to collect their own images, make connections between their images and their thematic goals, and create photographs and photographic illustrations. Images are manipulated using Adobe Photoshop and other software on Apple computers in the Photography Lab. All students finish the course with a portfolio of images. This wide-ranging but challenging course concentrates on improving photography skills, digital art techniques, and advanced image manipulation. Students explore a wide variety of photography techniques, from black and white film and pinhole cameras to advanced Photoshop manipulations and digital capture experiments. All students finish the course with a portfolio of images. IB Drawing & Painting, IB Photography, and IB Architecture are demanding, two-year courses of study in which students create a body of work that demonstrates a solid understanding of the vocabulary of the artist, photographer, or designer. Although the three IB Visual Arts courses share a common approach and lead to the same qualification, each is explored through the particular discipline. In their Visual Arts Journal, students read, write, think, and question what they do as artists, showing evidence of systematic research and investigation. Art appreciation and history are essential components of these programs. Students visit art galleries, attend museums, take part in workshops, and listen to lectures by visiting artists and designers. Students produce a comparative study research paper—examining the works of at least two artists, techniques for art making, and theories behind the work—that constitutes 20% of their final IB mark. Most importantly, students work in their chosen medium and can also explore various processes, techniques, and types of expression in a variety of ways, creating studio work that accounts for 40% of their final mark. In the second year, IB Drawing & Painting, IB Photography, and IB Architecture become self-directed, as students develop a personal visual style and symbol system appropriate to their chosen theme or area of inquiry. These courses are intended for self-motivated students who are seriously interested in the study of art. In addition to class work, students are expected to devote a further four hours per week to independent study and are encouraged to use the studio faculties outside scheduled studio hours. Both the Higher Level (HL) and the Standard Level (SL) are two-year long commitments that require a combination of Studio Work and a Process Portfolio. For HL and SL option A, the work is assessed at 40% studio work in the form of a personal exhibition with a written description of choices made and 40% process from the Visual Arts Journal. The Comparative Study research paper is assessed for the remaining 20%. HL students must complete 240 class hours in total, and SL 150 class hours in total. Each option is an intensive one-year course for advanced students with experience in art-making and independent study. Each option shares the same core syllabus requirements. Sustained Investigation: Students submit images and writing to document their inquiry-guided investigation through practice, experimentation, and revision. Selected Works: Students will submit works of art and design and writing to demonstrate skillful synthesis of materials, processes, and ideas. As a result of this assessment regime, each course is focused on in-depth, inquiry-based studio art and design making; on skillful synthesis of materials, processes, and ideas; and on articulating information about their work. A rigorous studio work schedule ensures students are able to grow rapidly and to gain experience in pursuing projects from start to finish.